I felt like Kate’s journey was very real and something that many young Christians go through. When we are very young, our faith is often given to us (or, in the case of people who are raised in non-religious families, sometimes withheld from us). Children are taught what to believe and how to act on their faith (or lack thereof) – both with purposeful lessons and by observing their parents and others. But at some point, everyone needs to do some soul searching to determine if the faith that they were raised with is truly their own. In a lot of ways, this book is about Kate’s journey to do just that. She has always been taught that there is a certain way to live and that anyone who chooses not to live that way is somehow wrong or bad. She can sometimes be judgmental – and she acknowledges that. But the world is very black and white for her and it confuses and scares her when she starts to see shades of gray. When Kate goes against everything she believes in to help a friend, it throws her life into chaos – she is overwhelmed with a confusing mix of guilt and loyalty to her friend. She wants desperately for things to stay the same as they always were – but they can’t anymore. They change. And Kate doesn’t know exactly how to feel about any of it. Then Kate falls for Matt, a boy at the camp she’s attending. And suddenly she finds herself desiring someone in a way that she had always considered sinful. Suddenly her boundaries and her ideals are tested in ways that she never imagined and she finds herself more confused than ever. And honestly, in some ways, she fails – she judges others for their actions then goes ahead and does some of the same things she judges others for. Then gets confused and scared and wishes she hadn’t done those things (maybe – or maybe not) and hurts people and messes up some more. And in the end she learns that things might not be as black and white as she once thought. By a long shot. I’ve read some reviews out there and I know that some people just couldn’t handle how judgmental and self-righteous Kate is. And I get that. I do. But for me, the journey that Kate went on felt real – even when it was messy and Kate wasn’t perfect. She wasn’t just a mean girl bully, she was a girl struggling with her own identity and struggling to figure out how her ideals matched up with the rest of the world. She wanted to experience the loving non-judgmental side of her faith, but the waters were murky and there were no easy answers for her. So, while I didn’t agree with everything that the main character did, and I didn’t even necessarily 100% agree with all of the conclusions that Kate drew at the end of the book. I still really felt like I loved the experience of reading it. Why? Because it made me think. It made me examine my own faith and ponder those questions that we all have sometimes – and think about the wrongs and the rights and the areas of gray. So this book was my highest rated of the series so far (Breathe, Annie, Breathe actually tied it) at 4.5/5 stars. 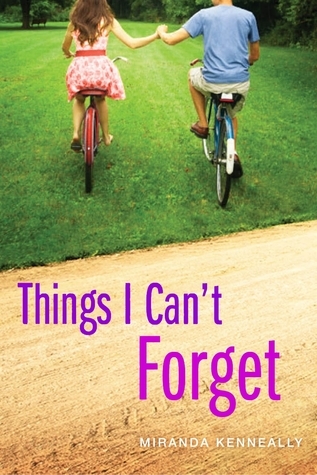 Sign into Goodreads to see if any of your friends have read Things I Can't Forget.